Phang Nga Hotel - Casa de La Flora, Khao Lak Resort Thailand - Hotel Official Website. 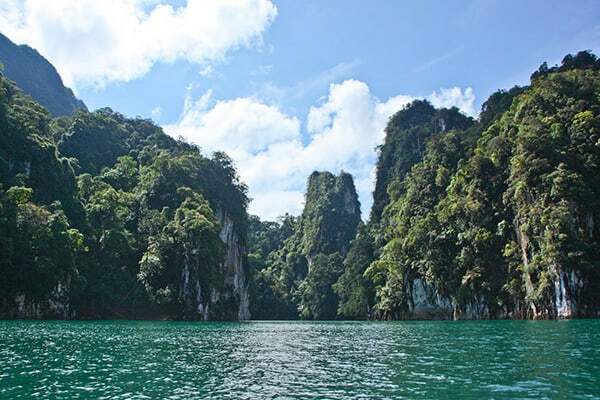 Phang Nga has much more to offer then you might think. First we will visit the in the forest located Waterfall. In the Tam Phung Chang Cave you can take a look at the stalagmites and stalactites. The monkey temple is included in this tour as well, since guests love to watch the monkeys and feeding them is just one of the cutest things and you can imagine. 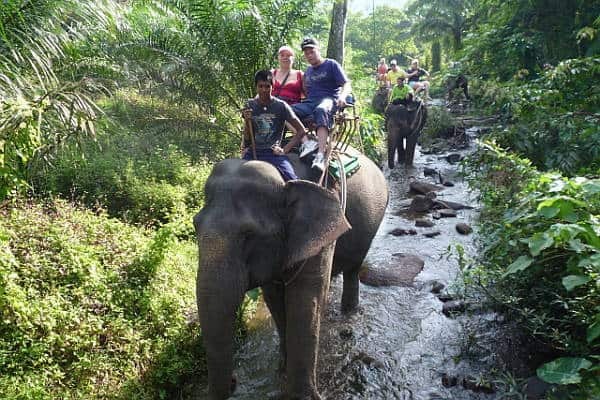 Elephant trekking, for those who love elephants and would like to explore the jungle on the back of elephants. … and have the possibility to take some beautiful pictures. It is also able to feed them after trekking. The Waterfall is very beautiful, where you can swim and relax. 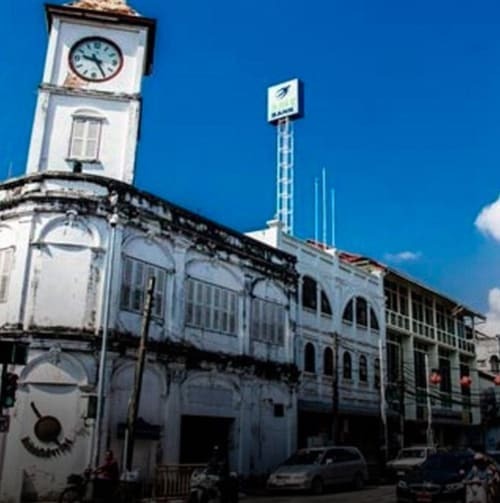 Phuket is a big city and if you are staying in Khao Lak it it’s worth going down to Phuket for a day trip. Out of the nature and back into a big city full with things to see. First we will stop at the Pra Put Temple ( Wat Pra Put ) and then you can see the panoramic view of Phuket Town at Big Buddha Temple. Later you will enjoy your shopping at one of the huge shopping malls in Phuket and you will have time to see the local market. At this small elephant camp you can explore the little jungle area & rubber plantation on the back of the elephant. After the trekking, you will have a bath with the gentle giants and a time for feeding them with a nice shot of your pictures. 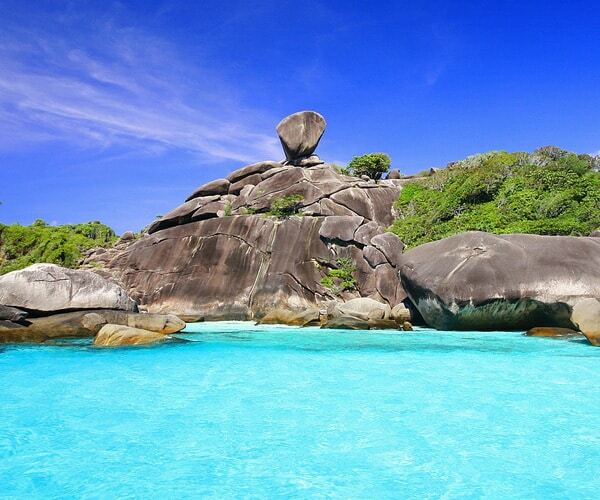 The Similan Islands National Park is known for long white sand beaches, crystal blue waters, warm tropical nights and cooling breezes coming off the Andaman Sea. On the nine uninhabited islands you can see the most beautiful sceneries from Thailand. Home for the best diving and snorkeling in Thailand, The Similan Islands are home to a huge variety of marine life and incredible opportunities to see rare and endangered species. While the underwaterworld may attract some people - there are also many varieties of birds and animals on the Similan islands. Siam Adventure Wold offers the Phi Phi early bird tour by speedboat from Phuket, meaning that we leave very early, so we are always away from the crowds or with not to many people. Our speedboat will depart from our pier in the Royal Phuket Marina and 50-60 minutes, where you are in a paradise name Phi Phi island. 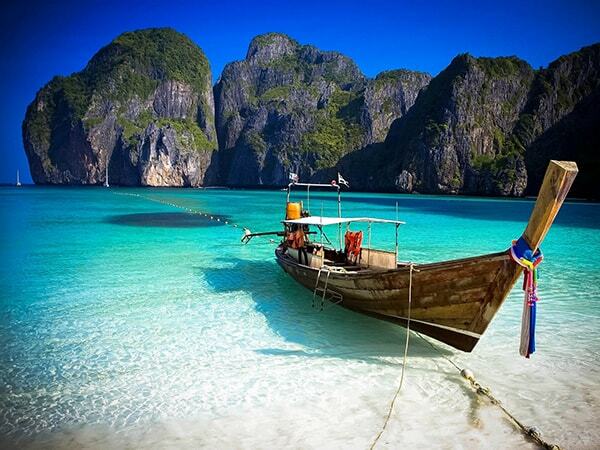 Enjoy Maya beach ,the famous beach where the movie “ The Beach “ was filmed, the stunning Phi Phi Leh lagoon with emerald water, Viking cave, Monkey beach and much more on our Phi Phi island speedboat tour. Something unique : you will enjoy a super beach lunch on Bamboo island. 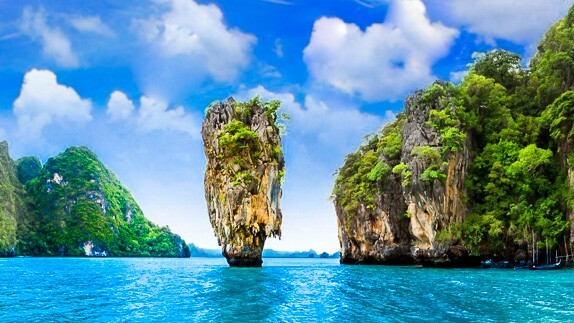 The place you have to go to is definitely James Bond Island. 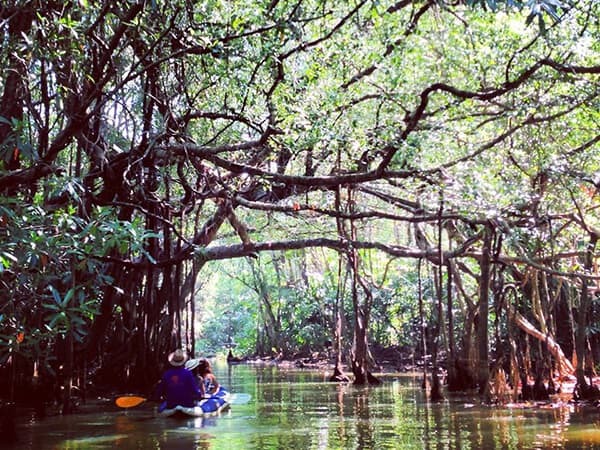 The amazing Mangroves you get to see from the long-tail boat are absolutely fantastic. Then 1/2 hour tour on the canoe through the lagoons around James Bond Island are some- thing you have surely never seen before. After canoeing we will stop at the famous James Bond Island to look around and of course take some pictures. Lunch will be served on Pan Yee Island, a village which is completely floating on the water. 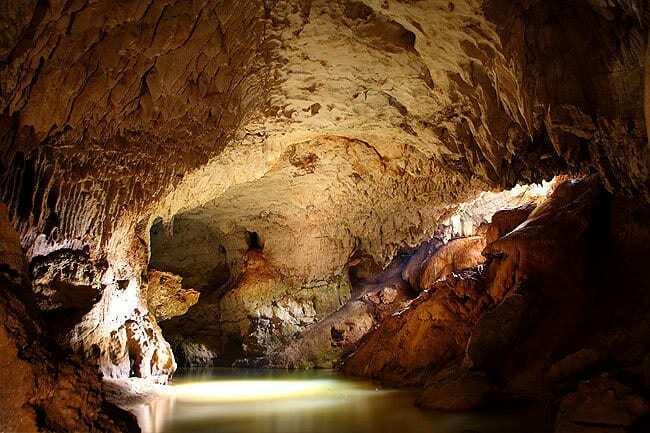 Next, we will take you to see the painting cave, those painting are more than 4000 years old. Last but not least we go to visit the monkey temple. It is located directly next to a Temple so you have the chance to go inside the temple as well. 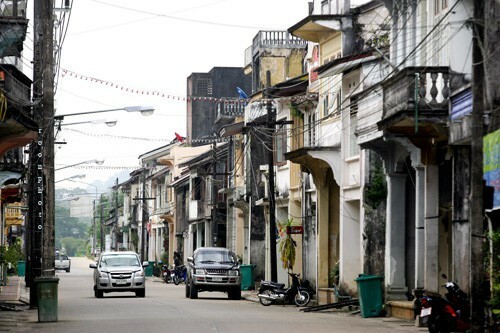 The old town of Takuapa is situated in the northern stretches of Phang-Nga province. An ancient port city with roots that can be traced back to the first century, ships in Takuapa harbor once carried goods to and from India, Arabia and ancient Roman outposts. The Nam Kem Tsunami Memorial has got to be seen before you leave Thailand. It was opened on December 26th 2005 exactly on year after the terrible Tsunami hit Khao Lak. The Cashew nut factory is very famous for Khao Lak as well. You will be able to watch the people produce. Muay Thai is a combat sport from the muay martial arts of Thailand that uses stand-up striking along with various clinching techniques. This physical and mental discipline which includes combat on foot is known as “ the art of eight limbs “ because it is characterized by the combined use of fists, elbows, knees, shins and feet, being associated with a good physical preparation that makes a full-contact fighter very efficient. 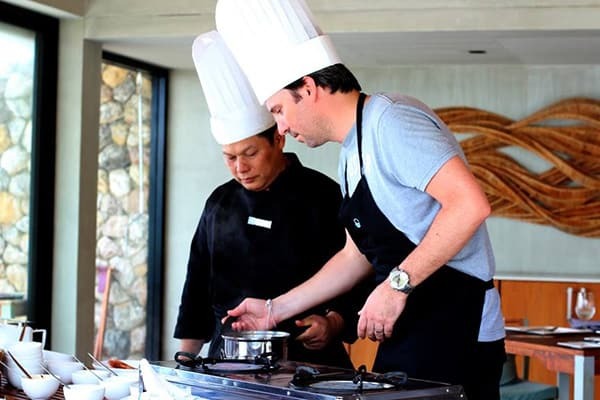 Learn and experience on Thai Cuisine “ A Secret of herbs “ with our Thai Cooking Class. Feeling a fascinating recipe of the most famous Thai food “ Tom Yum Goong “ ( Spicy & sour prawn soup ) or “ Phanaeng Gai “ ( Coconut flavored thick chicken curry and Thai dessert “ Kluay Buad Chee “ ( Banana in warm coconut milk ). Enjoy a Day of local Culture and spirit of Buddhist : of Sights, Sounds and Smells. 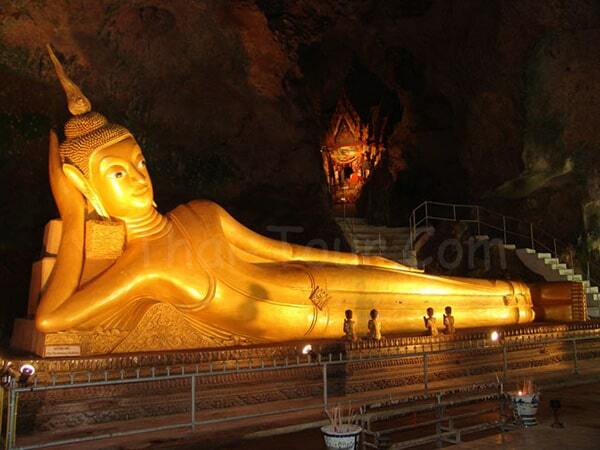 Visit the three most important, scenic and beautiful Buddhist Temples at Phang Nga Province. Are you up for some very exciting adventure? White Water Rafting Camp Song Prek is a very nice camp for people who are up for the day never to be forgotten day. After that wewill go to visit and swimming at waterfall. 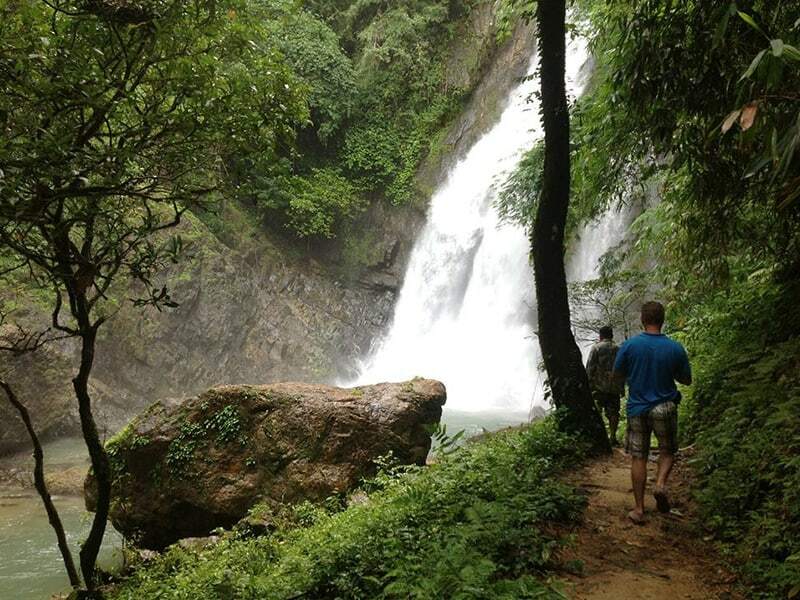 Khao Sok Discovery is a great trip with a lot of things to see. 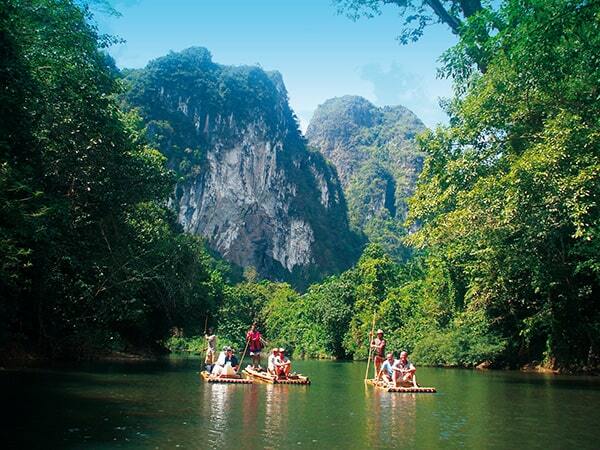 Bamboo rafting on the Khao Sok River through the jungle area is an amazing. It is also possible to go swimming in the river. (The rubber plantation is very interesting since you probably have never seen something like this before. The Monkey temple is made for people who have always wanted to feed monkeys, but please do not touch the monkeys, to feed them and take pictures of the very cute creatures. The Viewpoint is amazing because you can see over the whole jungle. Of course elephant trekking is great too, since the route goes all through the little jungle area. Chiew Laan Dam is a great trip with a lot of things to see, especially if you like nature and animals. The first stop at the view point, you can see over the whole jungle area of the Khao Sok National Park. The lake’s surroundings provide exciting views over mountains, bizarre lime stone formations and wild jungle. We will the stop for lunch at the floating restaurant and after that go for a quick bath in the lake before we depart again for Khao Lak.